In the recent Mobile World Congress, Vodafone and BMW introduced the Vehicular CrowdCell concept, a small cell providing coverage in the car when people are in it and outside when the car is parked. The presentation is embedded later on in the post. ...the BMW Group is unveiling the research project “Vehicular CrowdCell”. This project extends the concept of the “Vehicular Small Cell” presented last year in Barcelona. While the “Vehicular Small Cell” is a mobile femtocell that optimises the mobile radio reception inside vehicles, it is now also capable to enhance the capacity and coverage of mobile radio networks. The BMW Group is teaming up with peiker and Nash Technologies to present a prototype of the “Vehicular CrowdCell” integrated into a BMW research vehicle. The rapid growth of mobile data traffic, e.g. due to the increasing use of multi-media services such as music or video streaming with mobile devices, requires even more powerful mobile radio networks in the future. One strategy to increase the capacity and coverage of future networks is the integration of a large number of small cells and relays in addition to the existing base stations. 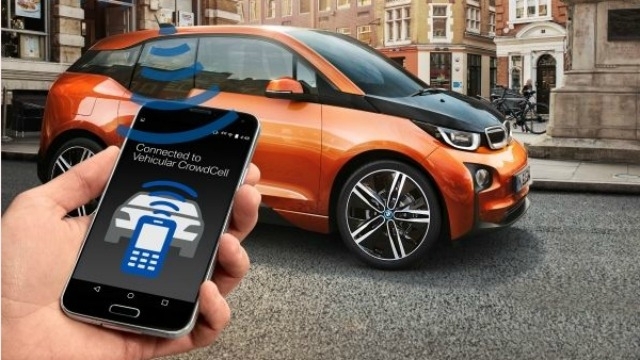 In 2015 the BMW Group, together with its partners peiker and Nash Technologies, presented the world’s first mobile femtocell in a vehicle. The “Vehicular Small Cell” optimises the reception available to mobile devices inside vehicles via the vehicle’s aerial. Now the concept has been extended to create the “Vehicular CrowdCell”. Based on data traffic and coverage demands, the mobile femtocells are dynamically activated to locally enhance mobile radio networks. The benefits of Vehicular CrowdCells in practice. One possible application of “Vehicular CrowdCells” are car-sharing fleets – in particular with electric vehicles. Here, a large number of vehicles spread over cities and regions could serve as local radio relays when parked. If one or more users are located close to a mobile femtocell, it is activated on demand in order to increase the bandwidth or provide additional network coverage. In such a way, the performance of the existing network can be dynamically optimized. Benefits for mobile phone users in hotspots include a higher data rate and the absence of reception white spots – especially in areas where the signal coverage is low. Nash innovations have more details about the earlier version of this, The "Vehicular Small Cell" here and here. I wrote a blog on this topic back in May 2014 here. 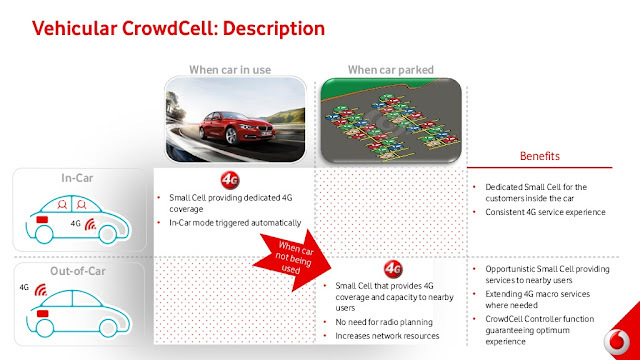 In that article I mentioned that for a small cell in the car, the biggest challenge is backhaul. One approach is to use one particular frequency for backhauling to the small cell and then the small cells output another frequency. This approach was mentioned in another blog post here. In this approach, TD-LTE was used for backhaul and it created an FDD LTE small cell inside the train. Why do I think this kind of approach work with 5G. In my other post about 5G spectrum, I mentioned that 5G will need multiple frequencies. Low frequencies for coverage, high frequencies for capacity and very high frequencies for very high speed throughput's. Because the very high frequencies, do not travel very far as compared to the low frequencies (with the same power), beamforming would be used. These very high frequency beams can be directed towards the Vehicular small cells, which in turn would create a much larger cell at a lower frequency. This approach would typically only be used in urban environments as in rural areas there is plenty of unused spectrum (until more uses are found - quite possible with the IoT device explosion). The small cells would also need advanced sensing and SON capability to work in harmony with the macro network. If you have an opinion, feel free to add it in the comments section. Hmm... what if you are a pedestrian depending on a parked vehicle's crowd cell and it drives away? If it's the only cell around? As soon as the car starts, the outdoor cell becomes indoor cell and it hands over all the devices connected to it to the Macro cell or any other cell nearby. This will happen very quickly, before the car can drive away.